I noted in the previous Stapelia/Orbea post that there were several more buds on the plant, which was a little worrisome considering the smell. One flower was tolerable -- we could only smell it if we were standing close -- but it looked like there was going to come a day when several flowers would bloom at once. Well. That day arrived, but before it did, the husband added more plant shelves above the kitchen sink. And the S. variegata was one of the plants that wound up on the new shelves, when it only had one flower open. This was nice, to a point, because it meant that every time I was near the sink, I could spend some time looking at the flower. It's pretty striking, and the smell was only intermittently detectable, so, you know, no real problem. Then a second flower opened, which was a little harder to ignore. And then on 13 October, a third flower opened, at which point the husband told me that something must be done. I elected to cut the flowers off, because they last too long to wait for one of them to drop and it's too cold to move the plant outside until the flowers are done. So here they are. I bite my nails. Always have. I would sort of prefer not to, in that way that you can dislike something but not care enough to do anything about it. I'm also not necessarily consciously aware that I'm doing it. Anyway. So I took the above photos and everything, came inside to upload them to the computer, and then all of a sudden GAH! WHAT IS THIS HORRIBLE, HORRIBLE TASTE AND WHY IS IT IN MY MOUTH? Apparently I had gotten some sap on my fingers while cutting the flowers off. The good news is that the sap doesn't taste like the flowers smell; the bad news is that it's intensely bitter. Oh my god. This can't be good. Is it poisonous? Am I going to die? So I ran to Google, as one does. This turned up a paper from 1981 in which the chemical hordenine (N,N-dimethyltyramine) was isolated from Stapelia gigantea. It's not clear that hordenine is responsible for the taste -- I found a number of references on Google linking hordenine to a bitter taste, but most of them were describing combinations of different things, not pure hordenine. In any case. Hordenine is not particularly toxic, and stapeliads in general aren't either, which is good news.2 There's some compelling anecdotal evidence that it wasn't harmful too, given that all of this happened a week ago and I'm not dead. But, you know. This is the sort of thing I like checking into regardless. And as a bonus, it answers my questions about how stapeliads manage to get by in their natural habitat without toxins or thorns. 1 For the record, neither of us had a problem with the third flower until the husband had to spend some time at the sink doing dishes. Had it not been for the dishes, we might have been able to cohabit with three flowers just fine: I only ever noticed the smell when I was within a couple feet of the blooms. So a single S. variegata flowers has a smell measured at 0.4±0.3 revoltings. 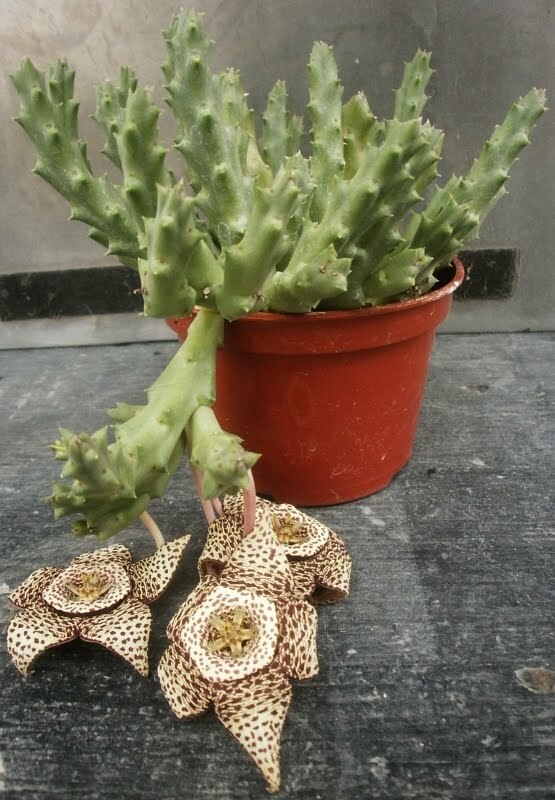 2 The very worst-case lethal dose quoted for an animal at Wikipedia (113.5 mg hordenine/kg body weight, for mice), scaled up to my size, multiplied out by the amount of hordenine in Stapelia gigantea (0.024% by weight of fresh plants), suggests that in the very worst-case scenario, if it were as toxic to me as it is to mice, I would have to consume something like half my body weight of the plant to get a lethal dose. And it's possible that the animal model that applies is not mice, but dogs, in which case the lethal dose is 2 g / kg, and I would have to eat 700 kg / 1500 lb. of fresh Stapelia in order to die from it. 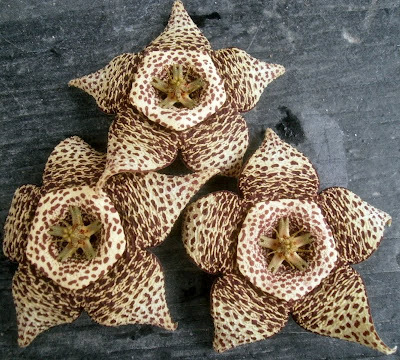 It is difficult to imagine a situation in which I would eat three-quarters of a ton of Stapelia. These numbers are, of course, all wildly speculative -- I don't know if S. variegata has the same concentration of hordenine as S. gigantea, I don't know what the lethal dose for humans is, I don't know if there might be something way more dangerous in the plant that would kill me long before the hordenine ever did, etc. But at least as far as this one particular chemical is concerned, I feel pretty untroubled. Now I want one of those more than ever! Too cool, I love those flowers! I was worried about taking in my Stapelia when it started to get too cold for it outside, but it turned out to be fine with one flower too. I could only smell it if I almost jammed my nose into it, and by then there were fly eggs all up in it from opening outdoors, so no one was going that close to it anyway. Good to know that it's multiple flowers that really put out enough stink to bother people at least. Stapeliads are usually bitter due to the steroid content. Some of those steroids are medicinal and the plants eaten in large quantities, such as Caralluma spp. These are very bitter, I have eaten a few. 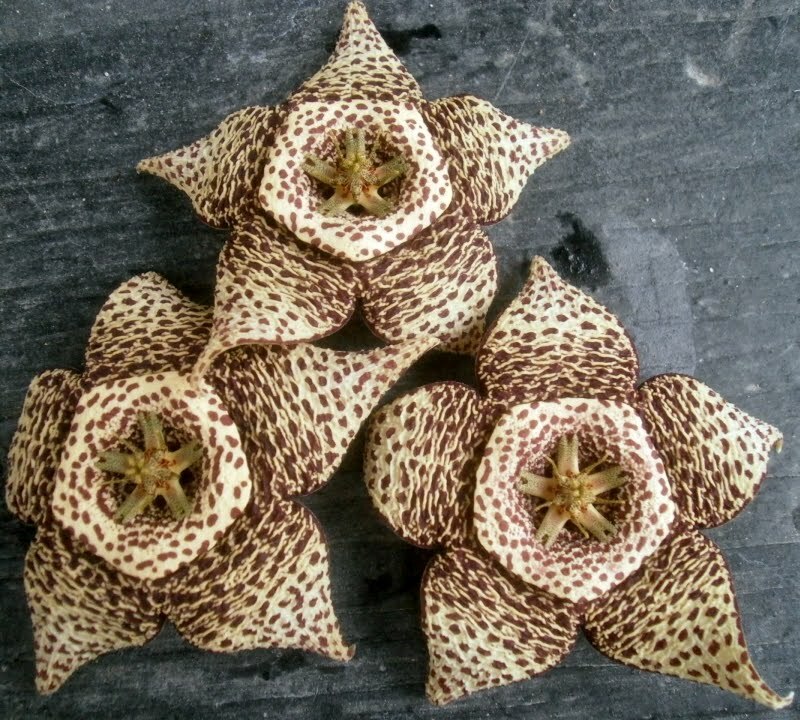 However some species are lethally poisonous, such as Orbea decaisneana used to poison everything from humans to jackals, birds and fish. Some other Orbea spp. are edible. I'd like to know how long the cut flowers last. I couldn't say; I left them outside on the cart where I'd photographed them, but they aren't still there now. We've had quite a few windy days since this all happened. It occurs to me, now that you've asked, that they'd be perfect for a Halloween floral arrangement. They're the right color, and the smell sort of works, and everything. If the last bud ever actually opens (we've been waiting for a long time), I'll try putting it in water and see.